Oh… those Common Core Standards! In my 5th grade class, we have been implementing the close reading strategies that support the Common Core Standards. At first, I was rather skeptical of these new standards. Now that I see the impact they are having on my students and their reading progress.. I am a believer! In my class, when we read, we discuss… a LOT. The students are learning how to create conversation around the stories we read. They are learning to read closely into what the authors themes are. They are beginning to understand these big metaphors. I have noticed how much they are learning by discussing. I wanted writing to be that way as well. First, let me explain how I am incorporating my writing with my reading. It would take hours to try and find reading resources and text dependent questions to use in the classroom. Luckily for us teachers, there is a website that has taken our basal readers and has created common core aligned lesson plans that go along with each of our stories. We have the text, and now we have text dependent, Common Core aligned questions and writing prompts to use as well. I have been using the Basal Alignment Project in my classroom, and it has been very helpful! Recently, we read a story from our basal called, “At The Beach”. Students were asked to find text dependent evidence supporting the fact that the main character, Fernado, learned lessons. 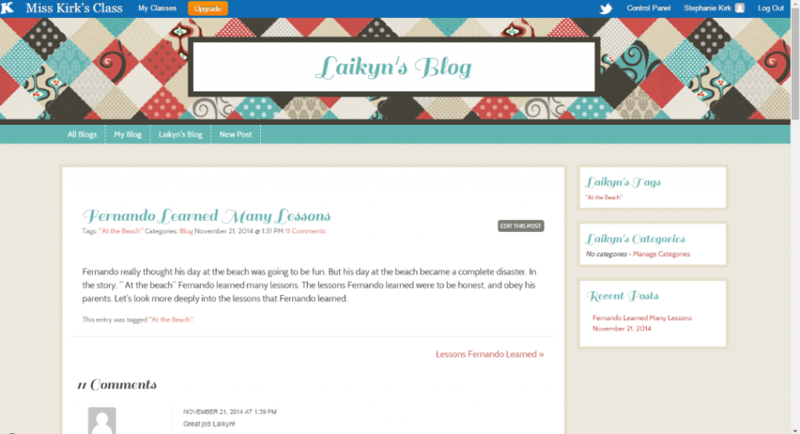 Next, the students were to write a paper explaining how Fernando learned lessons. Basically, they took their answers to the text dependent questions, and they wrote about it. They put it all together in an essay. I had to provide the students with lots of instruction on how to organize their papers. They weren’t confident enough to begin writing, so we took a few days learning how to organize their papers. After revising and editing, students normally would type and print their papers and file them away. I wanted something more. I wanted the students to come together as writers and discuss the content, organization, everything! How can I create a writing community packed with discussion & peer feedback? That question. Whew! I thought about it over.. and over.. and over.. I came up with lots of different ideas but nothing seemed to fit my classroom’s needs. It was either expensive, time consuming, or just impractical. I searched for websites that could aide in my writing community. I finally stumbled across a true gem!! 1. Students have a safe, password protected environment where they can write & save their work. 2. Students can publish their work and share with their classmates. 3. Students can immediately give & receive feedback to and from classmates. 4. Students have their very own “piece of the web” that they can call their own. Read more to learn how I have implemented this into my classroom! When the students first log in, they must provide their username and password. After inputting this information, students will be taken to a “Recent Posts” page. 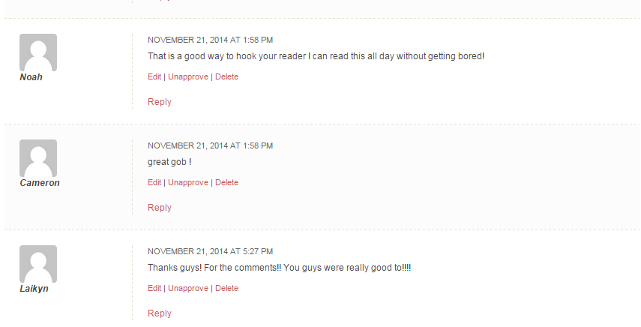 This shows the title, time, author, and comments of all recent posts from any member of our class. On the main page, you will also see the blog directory. This lists all students in the class. 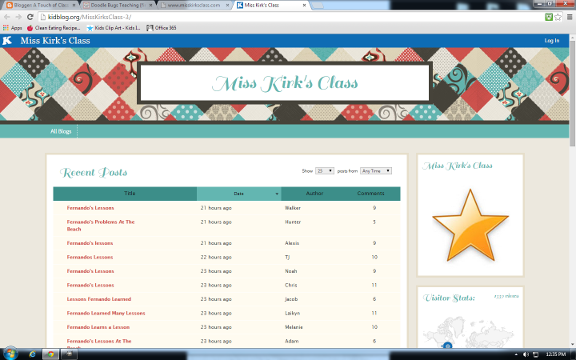 You can click on a student’s name, and it will take you to their individual blog. Only people registered in the class can see students’ writings. All content is password protected. From the main page, you can also click on a student’s individual post. This will take you to their individual blog as well. Here, you can see their current blog post as well as their previous posts and all comments. Well.. there ya have it folks! An easy way for students to, not only publish, but interact with their writings. Stay tuned.. my next post will be about how I taught the students how to organize their writing! There will be some freebies! !